Ron Hock explains how (hand) tools become and remain sharp. 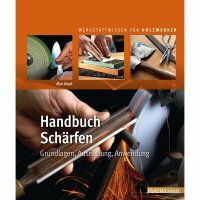 After a thorough description of different steels and an introduction on how abrasives work, the author describes the basic conditions under which tools exhibit good wood cutting performance. All necessary sharpening tools and materials are explained and compared. The following chapters deal with the individual tool groups: planes, chisels, scraper blades, hand saws, carving tools, woodturning tools, axes, knives and drills. Each of these chapters presents the special requirements for sharpening the respective tool.